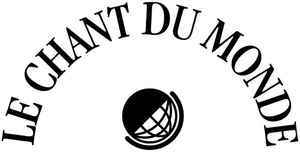 French label and Music publishing House founded in 1938 by Léon Moussinac. Supported by prestigious allied Georges Auric, Roger Désormière, Arthur Honegger, Charles Kœchlin, Darius Milhaud, Francis Poulenc, Manuel Rosenthal et Albert Roussel, Chant du monde gathered the first collection of traditional music recordings, and commissioned composers to transcript French oral traditions and music alike. After WWII, they acquired les Editions sociales internationales. CDM became shortly the French editor of Russian composers Serge Prokofiev, Dimitri Chostakovitch and Aram Khatchatourian and also the first producer of Léo Ferré, Mouloudji, Cora Vaucaire, then Colette Magny, Atahualpa Yupanqui, Uña Ramos or Vladimir Vissotsky to name just a few. The company merged in 1993 with Arlesian-based French distributor and music label Harmonia Mundi. They're now focused on classical music, pop music, children and traditional music.